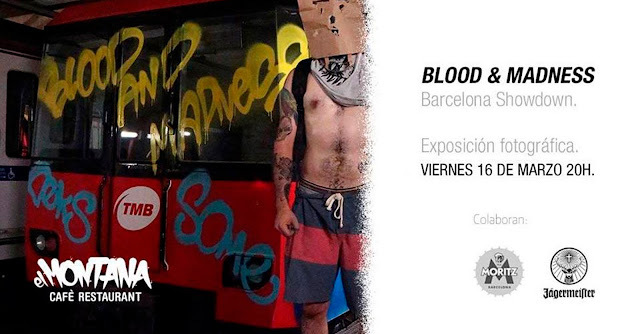 Esta tarde, a las 20:00 en el Montana Cafè Restaurant, se inaugura la exposición fotográfica Barcelona Showdown de Blood and Madness. La exposición muestra una serie de fotografías del entorno de las misiones de tren y metro; tuneles, hangares, entradas...y momentos de esas misiones.La música en directo correrá a cargo de Dr. Soulman. Nosotros no nos la vamos a perder, nos vemos allí !! This afternoon, at 20:00 at the Montana Cafè Restaurant, the Barcelona Showdown photo exhibition of Blood and Madness opens.The exhibition shows a series of photographs of the surroundings of the train and metro missions; tunnels, hangars, entrances ... and moments of those missions.Live music will be provided by Dr. Soulman.We will not lose it, see you there!